This is the true story of Nokomis (Grandmother) Josephine Mandamin who began Mother Earth Water Walkers, a movement of women (and men), who walk to raise awareness of how precious water is to us. Nokomis loved nibi (water) in all its iterations. Nokomis gathered her friends around her, and in 2003, they set out walking around the Great Lakes. A movement was begun. She herself has worn out three knees and eleven pairs of sneakers. In 2005 she walked almost 4,500,000 steps for water! The story is told using Ojibwe vocabulary. At first this was disconcerting but I was mostly able to figure out the story without peeking into the glossary at the end of the book. The illustrations help to make the new vocabulary clear. I still went back and reread it a few times to check my interpretations. The illustrations are bright and bold with stylized people and lots of colour. I love how Nokomis' love of nibi is captured in the first pages. Later on the images reveal all the ways water is threatened; from individuals letting water run while brushing their teeth, to corporations spilling oil and dumping toxins into oceans. My only wish is that the text was formatted differently. It is small and some pages are almost overwhelmed by it. This is an important book to use during a unit on the hydrosphere with all ages of students. It pushes beyond basic understanding of the water cycle into its importance for our survival. At the same time as it introduces readers to cultural awareness of nibi, it directs students of all ages to think politically about water. Perhaps they can come up with their own powerful ways to answer the Ogimaa's question, What are you going to do about it? Josephine Mandamin is an indigenous woman from Wikwemikong on Manitoulin Island. She now lives in Thunder Bay Ontario, Canada. 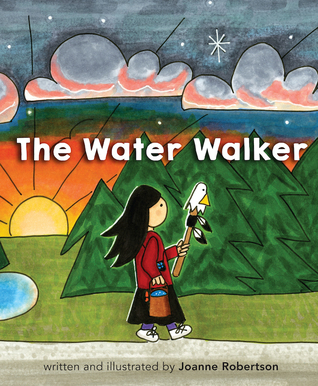 Click here to find out more about Mother Earth Water Walkers.